Private Tours is what we do best. For Private Boat Tours please email directly at helloelnido@gmail.com and gricarte@helloelnido.com. Separated from the ocean through a small keyhole-like opening, Secret Beach is only accessible by swimming through this door size opening through a narrow crevice in a rock wall. The Tour Guide awaits you on the side of the opening, waits for the water to gush out then he grabs you and throws you in... Here you'll see a beach surrounded by limestone cliffs which cannot be seen from open sea. Wow just WOW. Same as secret lagoon, try to enter this beach when there are only a few tourists. Best way to enjoy this is to book a private tour and head out an hour early and make it your first stop. Hidden beach are surrounded by limestone rocks formations. The swimming area resembles a natural infinity pool with crystal clear waters. The serenity of the place is manifested with the whistling of birds. Survivor Sweden finished their three month filming at this beach. This beach still has the some of the props used at the show. What makes this beach awesome is the cliff guarding the beach. This beach cannot be seen from open sea. You'll have to swim for five minutes ten it gets to be waist to knee deep as you walk to the beach tucked in on the left hand side. Better to try to float as the corals and rocks can scratch you. If you are facing the beach on the right hand side you'll see Nemo! 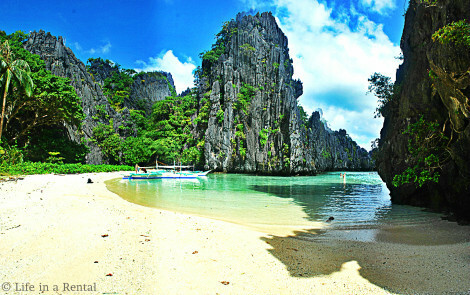 Make sure you ask our Hello El Nido Tour Guide to show you. There are over three black/brown seaweed safe havens for these endangered fish. Explore the beach to see where the tribal members slept. There are three beaches where they camped out. Known as Shrine of the Blessed Virgin, Matinloc boasts two fantastic snorkeling areas. Matinloc is heart in "Kuyunin" El Nido's local dialect. The island is shaped like a heart from aerial view. Best spot to take a selfie is at Matinloc. Climb the leveled out limestones to the top of the mountain, there you'll find a table top and take the "selphie" similar to the photo gallery. Star Beach is another spectacular snorkeling site featuring the wonders and beauty of the coral reefs, colorful fish, star fish and sea urchins. 30 meters out and 15 meters down more often than not you’ll see some turtles. These beaches are usually our lunch stops. An adjacent private island cove can be had on our private tours. A 20-minute ride from El Nido town by boat, the island gets its name from its helicopter-shape when viewed from afar. To me it looks like Bart Simpson laying down. Awesome snorkeling area and dive site. Here I saw a sea turlte from about 8 meters down on the leftmost side of this beach. The whitest of whitest of sand and white seashells can be found everywhere.